In the past, fleas were synonymous with dogs. If you had a dog, she had fleas. The great news is that in the modern day, fleas are more a relic of classic cartoons than a household problem. There are now so many effective ways to manage fleas and pets, no animal must experience the discomfort they create. Nor do homeowners have to worry about them infesting a house. Like ticks and mites, a flea is an external parasite common to canines. It is important to control these types of parasites because they can spread disease. For example, fleas can spread tapeworms – a deadly internal parasite (dogs get the tapeworm by eating the fleas). Fleas live in pretty much all parts of the country. They like to live near other animals so that they can feast on their blood. Fleas can often be found in animal bedding or close to wear a dog spends a great deal of time. A good way to find out if your dog has fleas is to brush their coat while they are standing on a white towel a blanket. If small black flecks fall onto the white surface, its your first clue that the dog has fleas. Wet the specks and if they turn red, it is droppings of digested blood that the flea has left behind on the dog’s coat. Treating and preventing fleas is a multipart process. The dog, home and surrounding environment must be treated regularly. If a dog has fleas currently, talk with your veterinarian about a good flea control shampoo. Be sure it has an insecticide designed to kill fleas and leave the lathered-on shampoo massaged into the dog’s coat for 10 minutes before rinsing off. Next, treat the dog with an appropriate preventative medication. If fleas are a problem in your area and the dog is not currently infested, this should still be done regularly. There are two effective types of preventative methods for use on/in the dog – topical medications and pills. Flea collars are not a good choice because they are not effective in controlling fleas. The solution that is best for your dog depends on a variety of factors including your local geographic location and how they spend their time – indoors or out, swimming, rolling in the dirt, only on walks on the sidewalk, et cetera. Consult your vet to find the best solution for your dog. Treatments include topical medications such as Advantage (imidacloprid) and Frontline (fipronil) that are applied to the animal’s coat and work for anywhere from a month to three months. Oral medications, such as Program (lufenuron) are given monthly. The downside to oral medications is that a flea must bite the dog for them to work. That flea will not then die, but the female fleas will be sterilized and unable to reproduce. This results in eradicating fleas in about two month’s time. 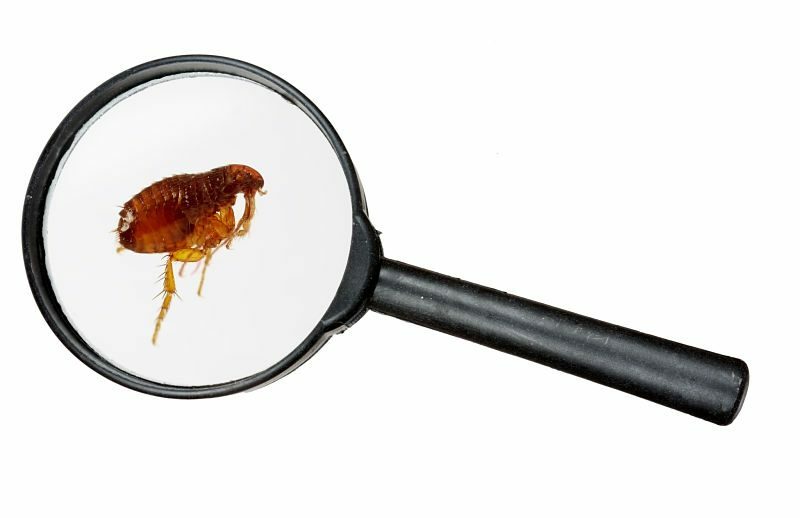 Finally, the environment around the animal must be treated for fleas to prevent them from coming back and infecting the animal (or coming into the home). This should be done both inside and out. A pet safe insecticide should be sprayed along all baseboards inside of the home with special attention given to areas where dogs spend a lot of time. Also, an outdoor pesticide product should be used to create a perimeter barrier around buildings and the perimeter of the yard. Houses and yards should also be kept clean. Vacuum weekly indoors and reduce clutter that fleas could hide underneath. Outside, keep yards clean and free of wood piles, leaves and other cool/damp hiding places. With good daily habits and the help of a vet, fleas no longer must be a bother to your or your pet. Which is serious relief for everyone’s comfort.